Chrysler Pacifica Hybrid output starts in Windsor, Ont. FCA invested US$744 million to retool the Windsor, Ontario, plant as part of the US$2.6-billion price tag to engineer and develop the Pacifica and the Pacifica Hybrid. Fiat Chrysler Automobiles began production of the Chrysler Pacifica Hybrid, the auto industry’s first hybrid minivan, on Thursday. The first Pacifica Hybrid rolled off the line at FCA’s Windsor Assembly Plant, which also builds the fully gas-powered Pacifica and the Dodge Grand Caravan at the Ontario factory. 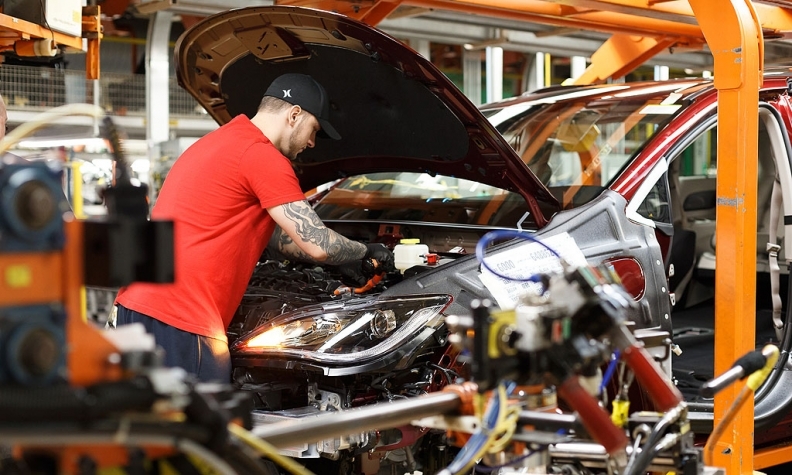 FCA invested US$744 million (Cdn $989 million) to retool the Windsor plant as part of the US$2.6-billion (Cdn $3.45-billion) price tag to engineer and develop the Pacifica and the Pacifica Hybrid. “Building the Dodge Grand Caravan, the Chrysler Pacifica with the traditional gas powertrain and the Chrysler Pacifica Hybrid on the same assembly line requires the expanded application of World Class Manufacturing methods and tools to ensure we deliver world class quality in every vehicle we make,” Brian Harlow, FCA North America head of manufacturing, said in a statement. A 16-kWh lithium ion battery is installed in the Chrysler Pacifica Hybrid at FCA's Windsor, Ontario, assembly plant this week. The Pacifica Hybrid will come in just one luxury trim level with a pre-tax base price of Cdn $56,495 in Canada. The Cdn $56,495 hybrid pricetag is at the upper end of the Pacifica range. The Touring-L, Touring-L Plus and Limited, which launched in February in Canada, range from Cdn $43,995 to Cdn $52,995. In October, the automaker announced a new lower-priced LX model with an MSRP of Cdn $37,995 and a Touring model at Cdn $39,995. The Pacifica plug-in hybrid will arrive at Canadian dealerships later this year and with volume in dealerships early next year. FCA said the Pacifica Hybrid will make its way to U.S. dealerships nationwide over the “next several months.” Factoring in a US$7,500 federal tax credit, the Pacifica Hybrid is priced at US$35,590, including shipping. U.S. sales of the hybrid minivan are expected to average about 8,500 a year through 2020, IHS Markit estimates. That’s a tiny slice of the overall minivan market, which has grown 11 per cent to 516,229 vehicles this year through November. A 3.6-liter V-6 engine and two electric motors power the hybrid minivan, which earned an EPA rating of 84 mpge. The Pacifica Hybrid has 33 miles of all-electric range and 566 miles of total range, according to the EPA. The minivan’s lithium ion battery pack is stored under the second-row seats and can be charged in about two hours using a 240-volt plug-in system, FCA said.